The "Matthew Flinders" is the roll-on roll-off ferry connecting Flinders Island with Tasmania and Victoria. Got on the boat at 1:40am after being told to be there at midnight - tired & cold. A howling westerly blowing meant 4m+ seas, forcing the Devil Cat ferry to Melbourne's cancellation. We "camped" (sat in our sleeping bags) in passenger's rather basic quarters below deck. The freight gets priority on this boat. The trip started out quite rough, and then got very rough. We kept hearing the ships' hull crashing into ocean. After about 90 minutes of this, felt strangely hungry. I was wrong. Linda and I (and most of the other passengers) took turns at bringing up dinner, then lunch, then breakfast. Having never been motion sick in my life, this was a strange and slightly surprising event. Mind you, we were sailing in the storm which preceded the one that skittled most of the 1998 Sydney to Hobart fleet, and there was a lot of motion. The morning was calmer, and we sat in sun on the top deck watching the islands sail by. While cooking dinner on the gas stove in the converted miners quarters of the Mt Lyell mining company in Queenstown, I heard a load bang accompanies by flames shooting from the cooker. While my first concern was for the well being of the dinner, I belatedly realised I came rather close to being incinerated. There was all this brown ashy stuff sprinkled down my left leg, and a rather pungent smell of burnt hair that is, I hope, not usually characteristic of my cooking. Hastings Caves and the Thermal Pool were the closest we got to Tasmania's South West National Park. The national parks run a tourist cave exhibition of hastings cave. Our tour was with forty other tourists including, kids, grannies, babies, teenagers and a bus load of Russians. The 40 minute tour took over an hour, most of which was spent queuing for a glimpse of the degraded and somewhat disappointing formations. The commentary of the tour guide was probably very interesting and informative, but I didn't get to hear too much of it over the screaming kids, gossiping grannies and the constant yabber from the Russians. Maybe it was just the CO2 levels in the cave, but I left with headache and a resolution never to return. The thermal pool was just a swimming pool with spring fed water. It was filled with running, screaming, splashing and bombing kids, and had a yellowish tinge that made me doubt the source of the pool's thermals. Since reaching the "arid region" north of Port Augusta it rained on us every day in South Australia one way or another. Sometimes this can be refreshingly pleasant. At 4:00am when you haven't bothered to put the tent fly on and the bucketing downpour corresponds with a 80km wind burst, it's quite a challenge. After the first few drops of rain I got out to put the tent fly on. Too late. For fifteen minutes in extreme wind and stinging torrential horizontal rain I clutched stark naked at the tent fly trying to keep at least a tiny portion of it covering the tent. Linda was in the tent holding down the corners trying to stop it blowing away. Everything was pretty wet, especially me. It's the first and last time I'd felt cold since leaving Victoria. Five minutes after the rain stopped, it was back to still, dry and stinking hot. On the long stretches between anything in central Australia, often the only water comes from bores sunk into the great artesian basin. This bore water has a horrible calcium taste. It's a bit like someone's put some milk in it, though not quite that nice. 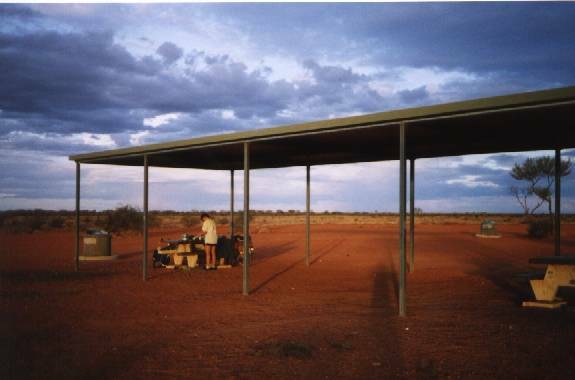 We'd been warned that he people the Mary River Roadhouse are extremely rude, and we should get what we need & go. Someone had gone to the trouble of grafittiing a sign on the approach road "Don't go there, very bab place, Good Luck!". Sure enough, as predicted the old crone running the place was stopping the German tourists' from using the toilets before they were customers, and mocking their stupidity (i.e. limited English) to boot. She was far more interested in stopping these non-customers using the loo than serving the others in the party with their wallets open waiting to buy things. "Their" public phone was inside where they could keep an eye on it (a friend of ours was recently kicked out of the roadhouse for using it to call internationally with a 1800 phone card), and a system of mirrors ensured no customer could remain obscured from supervision. We bought a ridiculously overpriced packet of biscuits and a soft drink, then asked if there was anywhere we could get some water. After tactfully pointing out they had drinking water, she said we couldn't have any. "The river's just down there". The river was a stagnant green swamp with "Don't Risk your Life, Estuarine Crocodiles" signs. Linda was somewhat grudgingly allowed to the use the loo. It was putrid. Obviously they never clean it. We left quickly so as not to be thrown out for not thanking them. I'm sure it's happened. Talking to the rangers at the entrance station (they get a lot of complaints), it seems they manage to offend just about everyone who turns up at "the roadhouse from hell". You don't even need to go in there. Recently someone was chased away for parking on the road out the front. The rangers reckon the place will be a gold mine once the "Under New Management" signs go up, and the offended tour bus drivers stop there again. After over four hours of fairly tedious riding, we were still 35km short of Coral Bay when a metallic snapping sound preceded a piece of metal flying from my bike. Linda stopped to recover it, but I had other things on my mind. My handlebars had discovered a new freedom allowing them to move independently of the front wheel. My first though was how on earth are we going get that repaired out here? My second thought was given I could no longer change gear, brake or steer, how on earth was I going to stop without braking my arm? Through good luck rather than good management I somehow brought my bike to a stop with me still in the saddle. Fortunately the Coral Bay car repair shop (a caravan with a business sign and a few tools) had a vaguely compatible replacement, but getting there was rather uncomfortable. I had to ride 30km holding my stem. The roadhouses have a real "screw you for everything we can" attitude that bugs me not a little. After a very long day in the saddle to Cocklebiddy we stayed in a "budget" motel room and ate at their restaurant. Supposedly this soften the attitude of the roadhouse operators to things like giving cyclists water. When paying for our meal and various other odds and sods we'd bought, I queried why the bill was $4 over the listed price for the items. "Oh, that's for your water". Sometimes we can hear them, sometimes we can see them planning their attacks, but when they start their bombing runs our attention is switched from the genuine potential killers (cars) to the the wannabes, the magpies. At one point we had a whole squadron attacking us simultaneously. "Incoming" one of us would scream, hoping to lock our radar on him and apply counter measures. We found a short sharp growling yell as they get close usually shocks them enough to abort their attack, at least for a little while. They much prefer to fly towards an unprotected head than raised fist. One particularly savage bird made a few not entirely unsuccessful attempts to peck holes in my helmet at Khancoban. The little bugger even waited for half an hour outside the local milk bar to have second go at me. I got even though. I donned my armor (bike helmet) and casually wandered out onto the street he was patrolling to do battle. When he thought the coast was clear he started his "surprise" attack. He got within three metres of me before I turned, yelled and threw my fist at him. This literally scared the crap out of him, and he retreated to a nearby car roof and later to a far tree as I gave him a full frontal baton charge. David 1, magpies 37. The last day riding into Sydney should have been a triumphant climax to a wonderful trip. I guess it was always likely to have been something of an anti-climax, but several changes to our home city made things even less pleasant than anticipated. Steroid enhanced Local Area Traffic Management for example. Linda didn't really want to do the ride in the first place, which is understandable as we'd already arrived at her childhood home the day before. The final day was summed up when we turned towards a park and a little footbridge that I used to short cut through on my way to work years ago. The footbridge was still there but the park and the easy access across the creek was replaced by the M5 freeway extension construction work. Motorists were getting angry they couldn't pass me as I screamed through a 25kph chicane at 40kph. After belting through a long and particularly tricky intersection, I spotted a car appearing from a blind spot as we approached a give way sign. Linda didn't see the car, nor the give way sign, nor me applying the brakes for a panic stop, resulting in our first and only bingle of the trip. Linda wasn't too happy with me when I rather unfairly blamed her for the crash, and we were barely talking while taking the ceremonial photographs at the finish. The moral is if you plan a bike odyssey, don't plan on returning home.